"It kinda feels like passing the torch," said Sam Campos, who's been trying to get his Dragonfly superhero character in touch with Kikaida, the '70s television Japanese superhero who was all the rage back then. And then the Generation Kikaida folks put together "Japanese Superheroes," a kind of summit conference of acrobatic crimefighters. Dragonfly was invited as part of the new generation. 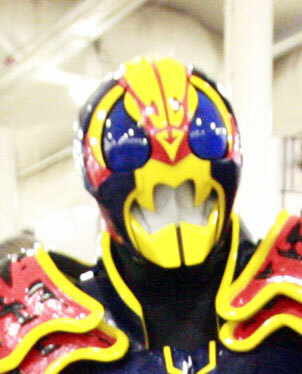 Also aboard, a live appearance by the Kikaida Brothers and Inazuman, the moth-man with lightning powers -- remember? 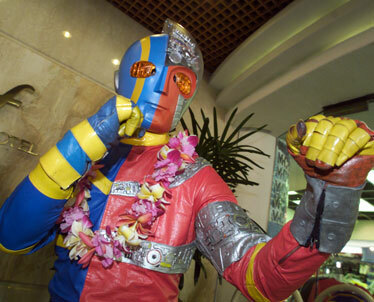 -- as well as actors from "Ninja EX" and "Blood of the Samurai," fan-powered cable-channel series filmed in Hawaii. Actor Ban Daisuke will also be on hand; he'll pose for pictures and sign autographs, but don't expect him to be in two places at once -- he acted in both Kikaida and Inazuman. Ikeda Shunsuke, who essayed Kikaida 01, is also expected. JN Productions, who is organizing the event, is busy preparing a DVD box set of Inazuman's adventures, which will be released right before Christmas. 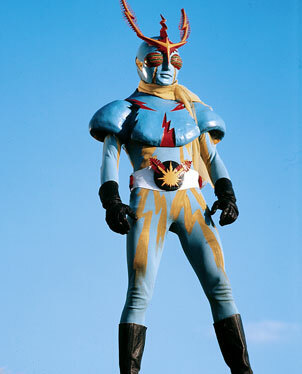 Need another fix of those Japanese superheroes of the '70s? Run, don't walk, to Shirokiya on Sunday for appearances by Inazuman, Kikaida (not pictured) and Dragonfly (not pictured), who's new to the gang.